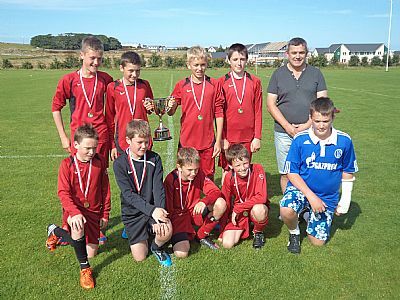 The youth football season restarted after the summer break with the R Clouston Cup and Plate competitions for S1 & Under club teams played at Picky on Sunday 19th August. Parents and supporters basked in the glorious conditions whilst players and referees sweated on one of the warmest days of the summer. The format saw 11 teams playing in three groups with the group winners and best placed second team progressing to the semi-finals of the R Clouston Cup and the remaining seven teams competing for the R Clouston Plate. The four Division 1 A teams were seeded with failure to reach the Cup semi-finals seeing them eliminated from both competitions. The first shock of the day saw Division 1 league winners Thorfinn A fail to reach the Cup Semi Finals when as runners up in Group B they had to face Group A runners up Stromness A in a penalty kick decider to decide who would progress. Stromness held their nerve winning the shoot out 4-3 to end Thorfinn’s hopes of a league and cup double. 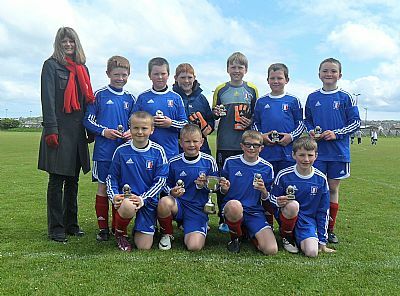 The surprise team of the day were Thorfinn B who came top of their group winning all their matches including a 1-0 victory against Stromness A to qualify for the Cup Semi-Final. Another excellent 1-0 win against Dounby A saw them reach the Final where they were to face East United A. In the final the more experienced East United side proved too strong for Thorfinn scoring three goals without reply. A very good tournament for the Thorfinn team however, and for East United victory in this competition for the third year in a row. 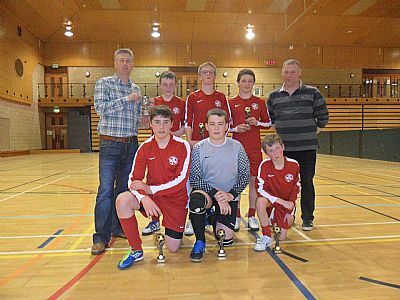 The Plate was an equally exciting competition with Stromness B eventually emerging victorious after three narrow victories, with two of the matches needing extra-time to separate the teams. The Plate Final against East United B was one of the most exciting games of the day with Stromness twice taking the lead but East United equalising both scores to take the final into extra time. A third goal for Stromness in extra time proved to be the winner. At the end of the finals Stephen Crawford OYDG Chairman congratulated all the teams on an excellent day’s football played in perfect conditions, with special mention of the two winning teams. He thanked the parents for their support, Picky goundstaff for preparing the pitches and introduced competition sponsor Bob Clouston who presented the trophies and medals to East United A and Stromness B. OYDG are grateful to Bob for his continuing sponsorship of this competition and thanks are also due to the three referees for the day – David Delday, Ian Scott and Gavin Leask. Final: East Utd A 3 Thorfinn B 0. There was plenty of excitement in the final week of the S1 & Under Leagues played at Picky on Saturday 16th June as the competition for Division 1 saw one of the closest ever finishes to the league. Going into the final week of fixtures Thorfinn A had a slight advantage over Dounby A and things looked to be heading Thorfinn’s way when they beat Stromness in their opening game whilst at the same time Dounby were losing out to East Utd. However Thorfinn were also to lose against East Utd whilst Dounby beat Stromness. With the final two matches to be played three teams were in with a chance of winning the league with the winner of the Thorfinn v Dounby match guaranteed the title. East Utd needed this match to end in a goalless draw and victory over Stromness would see them pip the top two. At half time there were no goals in the top match but midway through the second half Dounby opened the scoring to put them in the driving seat. However they were unable to hold onto their lead and Thorfinn equalised shortly afterwards to secure the 2 points to clinch the league. Dounby B went into Saturday’s matches as favourites for the Division 2 title and despite losing to Thorfinn C their nearest challengers Stromness B also dropped points, and two further victories were sufficient to win the league for Dounby. 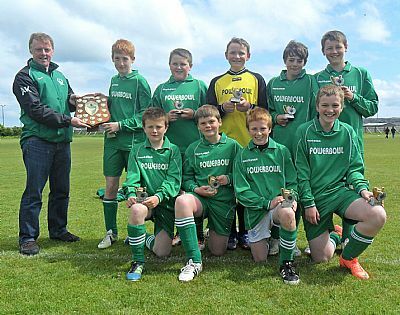 This is the first time that Dounby have won the competition and the hard work done by the Dounby club in recent years in terms of youth football development is now starting to pay dividends. At the end of the competition OYDG Chairman Stephen Crawford congratulated the winning teams and commented on the exciting climax to the league. He thanked the clubs for running the leagues, all the referees and the Kemp Families for their continued sponsorship of the leagues. Andy Kemp then presented the E G Kemp Shield to Thorfinn A and Jill Robb presented the B W Kemp Cup to Dounby B. East Utd A 0 Dounby A 1; Stromness A 1 Thorfinn A 2; Thorfinn A 0 East Utd A 0; Stromness A 0 Dounby A 0; Thorfinn A 2 Dounby A 2; East Utd A 5 Stromness A 0. East Utd A 0 Dounby A 0; Stromness A 0 Thorfinn A 0; Thorfinn A 2 East Utd A 1; Stromness A 0 Dounby A 4; East Utd A 4 Stromness A 1, Thorfinn A 1 Dounby A 0. 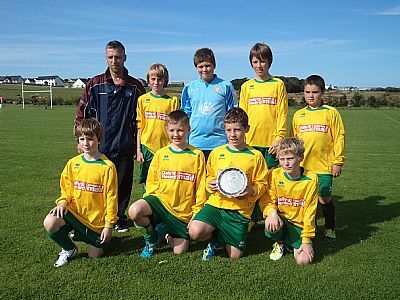 Thorfinn C 0 Thorfinn B 0; East Utd B 3 Dounby C 0; Dounby B 0 Stromness B 2; Dounby C 2 Thorfinn C 3; Dounby B 4 East Utd B 0; Stromness B 1 Thorfinn B 0; Thorfinn C 1 Stromness B 5. 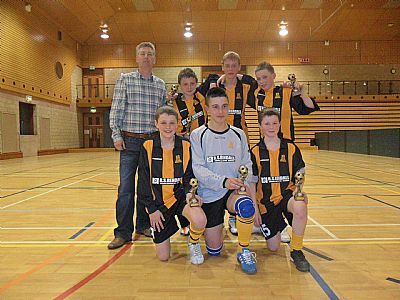 A goal in the last second of the final by Joe Wilson secured a dramatic late win for East United A in the final of the W Hourston Indoor 4’s for S2 & Under aged players played at Picky last Friday night (20th April). In a very tight final against Rovers A either team could have come out on top with Rovers having to thank their keeper for a couple of excellent saves which prevented East from taking the lead. It was Rovers who came closest to scoring however with a shot which hit the post towards the end of match. Just when it looked like the match was heading towards extra time United struck the only goal of the final and there was no time left for Rovers to attempt a comeback. Nevertheless, a very good performance by the Kirkwall team against the pre-tournament favourites. For United success enabled retention of the trophy for the second year in a row. Earlier both teams had comfortably won their group matches, and in the semis, East beat their B team, with Rovers outplaying Kirkwall rivals Thorfinn. At the end of the competition OYDG Chairman Stephen Crawford congratulated all the teams, and in particular the two finalists on providing such a high quality match to conclude a good competition. He then handed over to Tom Macphail, representing the sponsors who presented East with the winners trophy and medals and Rovers with the runners up medals. OYDG would like to thank W Hourston Jewellers for their continued sponsorship of the Indoor 4’s, and thanks are also due to the referees for the competition - Shane Stanger, Ivan Johnston and Charlie Alway. Dounby B 4 Thorfinn C 1; East Utd B 4 Thorfinn B 0; Rovers A 1 Stromness A 0; Thorfinn B 2 Dounby B 1; Thorfinn C 0 Stromness A 1; East Utd B 2 Rovers A 4; Dounby B 3 Stromness A 2; Thorfinn B 0 Rovers A 3; Thorfinn C 0 East Utd B 4; Rovers A 2 Dounby B 0; Stromness A 3 East Utd B 3; Thorfinn B 2 Thorfinn C 1; Dounby B 0 East Utd B 3; Rovers A 7 Thorfinn C 0; Stromness A 3 Thorfinn B 2. Dounby A 4 Dounby C 1; Rovers B 1 Thorfinn A 3; Dounby C 0 Thorfinn A 2; East Utd A 3 Rovers B 0; Dounby A 0 Thorfinn A 3; Dounby C 0 East Utd A 3; Rovers B 0 Dounby A 5; Thorfinn A 1 East Utd A 4; Dounby A 0 East Utd A 2; Rovers B 1 Dounby C 3.